The weekend really is a great way to get to know people within the club as well as experience a range of running sessions and activities that you might not have experienced before. It is aimed at all abilities, so please do not be afraid to come along – you will be well looked after!! The weekend is split into 3 sessions with all food (except Sunday lunch), running, activities and talks included. Each session on the Saturday costs £8 per person to attend, and Sunday is FREE (you need to pay for your pub lunch if attending). A proposed schedule for the weekend can be found on the email from Wayne Boardman. Set up the course. This takes place on Saturday 24th November between 10am and 12pm. Make sandwiches for the race. This takes place on Saturday 24th November between 10am and 12pm. Pack down the course. This takes place between 12pm – 1pm. Please reply to Wayne’s email if you can help. Moving onto the running and racing and even before the week was done we had a new inductee into the SJ Marathon Club with Dave Bartlett completing his first 26.2 miles at Phoenix Running’s ‘Once Upon A Run’ Hickory Dickory Dock Marathon. He was ably assisted by the ultimate wingman Nigel Evans. Onto the weekend where Ian Watson and John Tzanetis took part in both the Sprint and Middle Distance National Orienteering Championships which combined running with navigating. Lots of members in Parkrun action this weekend as the Endless Summer continues. At Frimley Lodge seventeen members toed the line and joined the masses around the football pitches before safely navigating the Basingstoke Canal towpath. James Ratcliffe recorded his fastest time of the year to be first SJ home. Lina Johnson and Roger Halliwell ran at Frimley for the first time while Sam Weller, Mo Willcox and Alison Bones all recorded PBs. Over at Bracknell another good turnout with thirteen members in action. Krzysztof Zielinski led members into the finish with Alistair Ingall-Tombs clocking a PB and Sharon Fields running this venue for the first time. Over at Rushmoor John King was first member to finish. As there was no Run Down last week we are doing a special shout out to Liz Ujszaszi who beat 30 minutes for the first time en route to a PB. Lots of Tourism again this week. The regular home yet away runners John Tovell ran at Crane Park, Will Lucas at Seaton, Kim Reeves at Llanelli Coast, Stuart Overhill at Bushy Park and Kevin Forster Dungloe. Close to home Charlie and Lottie St Aubyn sampled the hilly Henley course and were rewarded with top 20 finishes. Martin Gould also sought out the hills at Homewood (spoiler alert: we’ll be organising some SJ tourism here soon as part of preparations for XC). Further afield Alurie Dutton and Yvette Glacken went to Lowestoft, Bev Matthews to Tamar Lakes, Richard Boese to Blandford and Sarah and Paul Alexander to Scunthorpe. 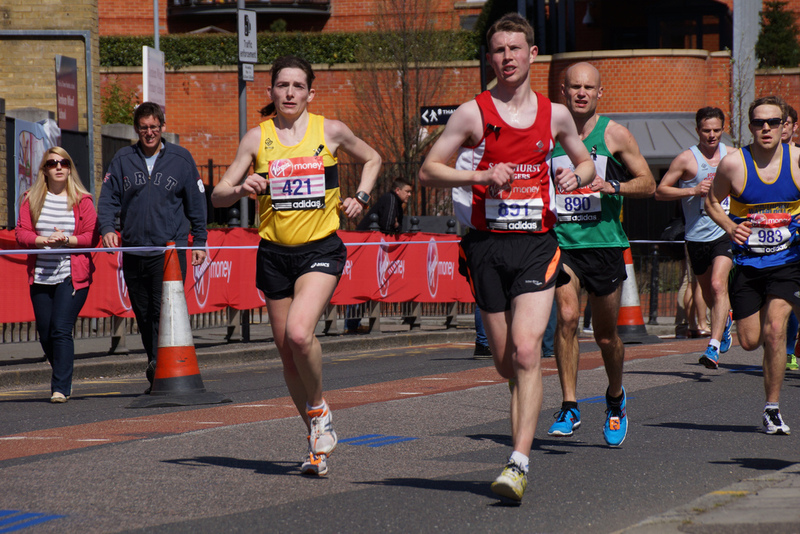 Maidenhead Half Marathon saw seven SJs tackle the 13.1 miles with every one of them putting in strong performances. Jim Haffey had a good run at the Overton 5 after a challenging August finishing in 44:51. A multitude of Sandhurst Joggers joined Claire Hobson as she took on her hugely challenging #runformum as she ran from Ascot to Rochester over 4 days. Sadly we have to report that Stephen Casey failed to beat 4 minutes for the mile again this week. We are confident he’ll have another go next week. Monday: Patrick will be leading the Monday night chatfest from Sandhurst Sports Centre at 7:30pm. The route will cover approx. 6 miles and is very likely to be off road as its the height of bluebell season. This is one of the most sociable runs of the week and a great opportunity to catch up with friends or discuss the preceding weekend. And don’t forget the Monday Mantra ‘Mondays defo make me faster’. Tuesday Club Run: The biggest club run of the week will as always offer multiple groups to cater for all abilities from beginners through to faster and more experienced runners. It’s perfect for novices and those coming back from injury or a long lay-off because you can start with an easy group and work your way upwards. The start time is 6:30pm as always, this week from Morgan Rec in Crowthorne. Wednesday: Sharon and Andrea are the General Members for Wednesday and they have a great route planned for this week. Join them at Sandhurst Memorial Park at 7pm. The 10k to 10 mile Group will be progressing to 5 miles this week. Meet at the Memorial Park at 6:30pm as usual. Thursday: This week the threshold/improvers run will be back on the road and Nikki will confirm the route nearer the time. This run is suitable for all abilities and as this run grows in popularity there are even more groups of varying speed to fit with your ability. There is also a shorter route and a sweeper to make sure nobody gets left behind. Meet at Sandhurst Sports Centre at 7:30pm. Sunday: Check Facebook to find out who is running at The Lookout at 9am. It’s a flexible run to suit everybody’s needs and is either adapted to fit with distance targets or multiple groups are formed. The three ‘Cs’ of Coffee, cake and chat are enjoyed in the cafe post-run. Sunday also sees the River Relay where three SJ teams will be racing along the River Thames from just outside Windsor to Kingston-upon-Thames on a 26.2 mile course split into 5 legs.